i think there is something to be said about classic items for your wardrobe. these are things that might cost a small initial investment but in the long run will pay off because their cost per wear will be far less than most items. i can't tell you the number of times i have bought something because it was 'trendy' and ended up wearing it only a time or two. however there are also a good number of items that i have purchased and have worn for years. first, jewelry is one of your most timeless and classic wardrobe items. there are just some things that never go out of style. 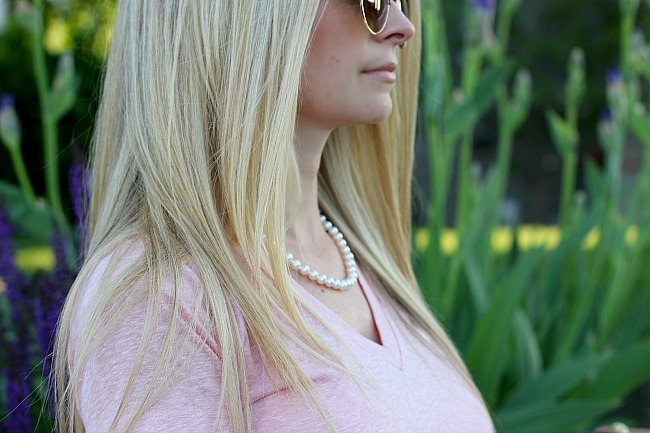 simple jewelry pieces like a pearl necklace/bracelet are things i have owned for years and work well with so many different styles from casual to formal. Tman and i purchased a necklace/bracelet/earring combo years ago and i still wear them to this day. the pearl necklace and bracelet pictured here are gifts from The Pearl Source. click here to see what other pearl items they have to offer. additionally, a good watch will last you years, sometimes decades depending on the quality. 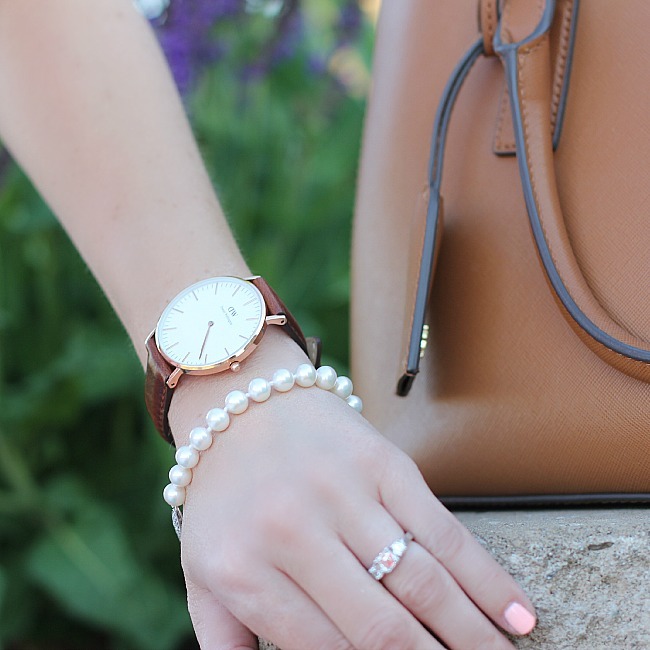 i was so thrilled to add this Daniel Wellington watch to my jewelry collection. a timeless leather band and rose gold face will last through all clothing trends and styles. they were also generous enough to offer 15% off to Blushing Basics readers until June 15th. simply visit www.danielwellington.com and use code blushingbasics. third, sunglasses. sunglass styles vary and styles changed drastically each season but let's be real, how long have Ray Bans been around? ages. has their body style changed? no. the variations come in lens color or hardware color but the basic body style has stayed true and classic for years. if the real deal isn't in your budget opt for a similar body style in sunglasses. it doesn't have to be a name brand, just know what styles and shapes have stayed popular throughout decades. i hope that helps you get on your shopping way. if you are interested in any of the items i am wearing click on the picture link below to see where they can be purchased. by the way, if you haven't tried these TOMS wedges you should. they are the most comfortable sandals ever, have a super reasonable price point and come in a variety of colors.